Mailbox storage size quota is probably the biggest problem we have. every day we get calls from users complaining they cannot receive or send emails because their mailbox is full. we currently have a policy of 200 MB mailbox quota for all users across the company with the exception of some VIPs. some users have openly criticized our policy for being too stingy, and outdated, basing their arguments on free mail services like Gmail and Microsoft Live Mail which theoretically give them unlimited mail storage space. 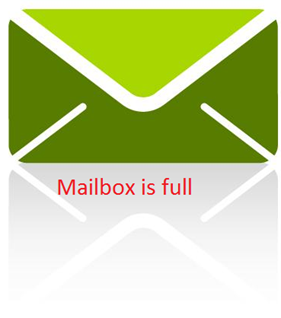 with all honesty I wish we could give them unlimited mailbox storage space as well, but we are not Microsoft or Google with huge datacenters to store data, so we have to fiddle with what we have. as of now our exchange data store is about 100 GB, and because we are still running exchange 2003 ( planning to migrate to exchange 2010 early next year ) the data store have to be stored locally on the server disk drives, and there is only a certain amount of data that can be stored on these drives before performance starts to become a problem. on top of that, we need to make sure this data store gets backup every day to ensure disaster recovery, and deleted messages restoration if asked to be restored. We also need to make sure exchange performance is optimized with minimal down time. for the last 5 years we probably have had 99.9% exchange availability ( mostly scheduled down maintenances) and I think the reason we have been able to maintain this up time is because the server is not overloaded, and the database is optimized. Currently we set Outlook on users computers to auto archive email older than one month, and keep that archived mail locally on the computer hard drive. we guaranty email restore up to one month ( tape backup) after that, users are responsible to do frequent backups of their PSTs. the problem is they don’t, and we end up with a lot of PST files on network shared drives that we have to backup. people that have been working in the company for a long time have PST files as big as 15 GBs. I started testing an archive solution like http://www.red-gate.com/products/Exchange/ with the idea of eliminating this problem, and give users plenty mailbox storage space ( not on exchange hard drives, but on cheap storage drive like a NAS ) but it did not work. not the software ( the software is great ) but the idea of implementation. let’s be honest, true unlimited storage space is not possible, not even Google or Microsoft does it, so when we started defining our email retention policy, and how much mail we would be able to keep before we started deleting, people did not like it. not even 20 GB of storage was enough. I think people by simply having the idea of limitation get uncomfortable. anyways, we are now testing exchange 2010 which is more flexible on data storage location, so hopefully our users will get a little more room on their mailbox storage size soon. what’s your email quota policy? do you give users unlimited mailbox?